Welcome and a belated Happy New Year to all our Newsletter readers. We hope you had a great Christmas and are now enjoying a prosperous New Year. In this Newsletter you can find info on Rare and Classic parts, some scary pictures of a S280, a bizarre Russian invention built by an English Car manufacturer and the usual lists of Cars for sale and dismantling. - Brand new mechanical fuel pump for a 170S. The owner of this car needed a new pump rather than an overhaul kit as the body of the old one had worn out. - New wiper arms and blades for a L319 van. Some one at some stage had fitted aftermarket ones and thrown the correct ones away as they could not get refills for the blade! - Early style subframe mounts for a W111 sedan. The very first of the W111 sedans had a number of different parts in the front suspension which are now NLA (No Longer Available). However we managed to find a set for this customer. - Chrome mould above the rear window for the soft top on an early 230SL W113. - Roundie/Ponton windscreen seals, both front and rear. These can also be used to make screen seals for the 170 and 300 range from the 50's. - Pistons, rings, bearings and gaskets for a 170D engine. - New conrod bolts for the same engine! - Dark brown soft top in original fabric for a W113 280SL including the rubber side seals and new wires. - A set of rubber seals for a W111 250SE coupe, including the fresh air flap seal and the correct plugs for the jacking point holes. As mentioned above this is just a sample list. Whatever you want we can have a go at finding it for you. Try us by calling 1300 787 300 or e-mail us here. W201 180E 1991 179000kms, front damage, white with very nice grey interior, good dash, auto and engine in great condition. L319 cab chassis 1958, rare Australian assembled version, 180D engine with variable injection pump timing. Rusty but with good mechanicals. Some bits from this will help us with the restoration of our O319B Coach. We have started the restoration on this and will report on it in the next newsletter. Also, we don't have it yet, but we are trading a W108 250S next week. The engine is low on compression on one cylinder but the rest of the car is in great condition. So if you need any bits for your 250S, 180E, 230E or L319 give us a ring on 1300 787 300 or e-mail the spares department. Q: What's the worst thing that can go wrong with your Air Conditioning system? Q: What's the worst car to have to change an evaporator unit in? 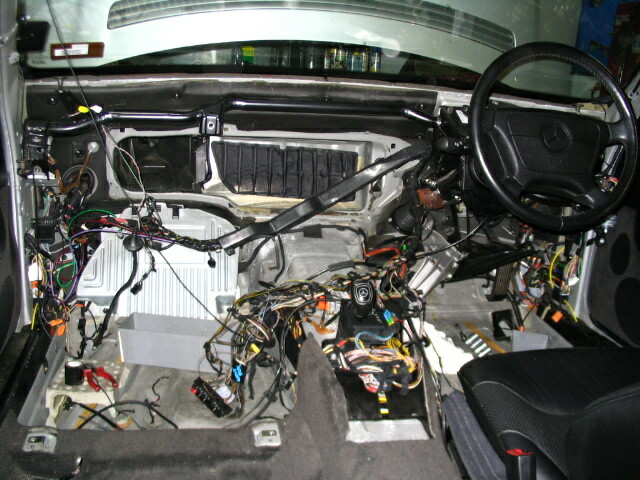 The evaporator is the part under the dash that is cooled by the gas in your air conditioning system. If it develops a hole then you are in trouble. 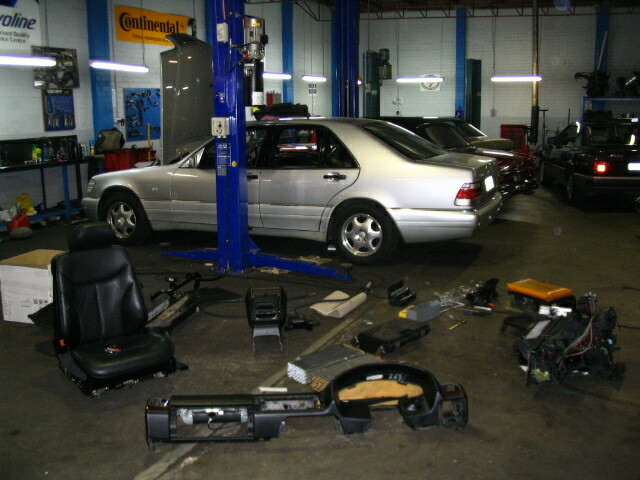 You either go without Air Conditioning or embark on a very large repair. See the pictures on the right. These are from a customers W140 that suffered this problem. Almost every single part on the cabin side of the firewall had to be removed to get the heater box out that contains the evaporator unit. The job took three days to complete. Vito wins Van of the Year again. When the Vito van was released in 1996 it won the European van of the year. Now the new Vito has won this much coveerted award again with the New Vito. This article from Daimler Chrysler. 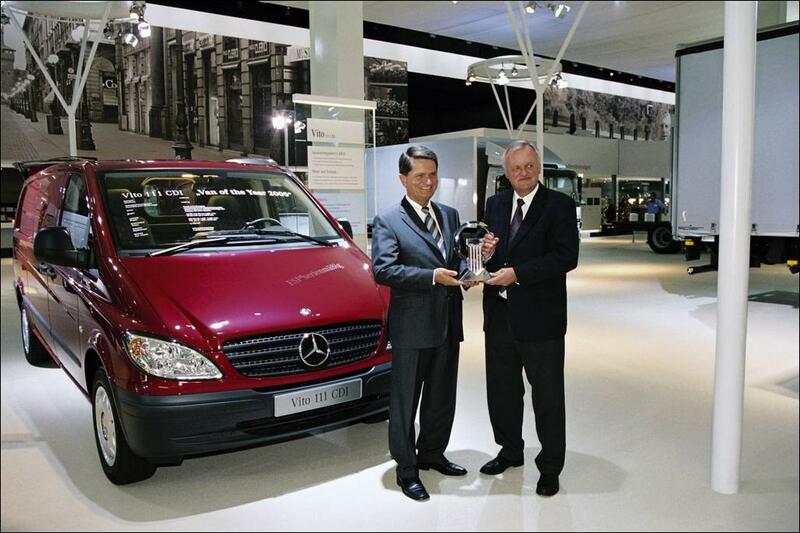 The new generation Mercedes-Benz Vito Van has just been awarded the most prestigious accolade in the light commercial vehicle sector, the International Van of the Year 2005 (IVoY). Beating off stiff competition from the likes of Ford, Vauxhall, Volkswagen and Renault, the Vito was awarded a total of 83 points out of a shared 197. Pieter Wieman, Chairman for the International Van of the Year jury said: “The Vito’s design has impressed the jury on a number of fronts. The fact that Mercedes-Benz had succeeded in bringing driving characteristics, comfort and styling levels close to that of a passenger car can be highly commended. This much sought after trophy is presented annually to the van that, in the judges’ opinion, makes the most significant contribution to the efficient carriage of goods by road. N.S.W newsletter readers who were interested in the Classic Adelaide should tune into Channel 10 at 4.00pm this Sunday the 30th for a one hour special on it. There should be some good coverage of all the 300SL and 190SL's that came out here for this event. More details here. Other states should check there local TV guides. 8.. What Do You Call Cheese That Isn't Yours? 9.. What Do You Call Santa's Helpers? 19. What Is The Difference Between a Harley And a Hoover? Ever heard of the "Tweel"?? Click here to find out what it is. Stefan from the Mercedes veterans mailing list sent in this link showing before and after shots of his 350SDL after it had been hit by a Saturn going 60+mph that run a red light. Interesting to note, is that the car has dual airbags, both of which obviously helped to save the occupants lives. What would have been interesting would have been to see pictures of the Saturn and to know if the driver survived. Also talking about crashed W126's, on the UKTV channel on "FOXTEL" (Australian satellite TV for our overseas readers) the was a program called 5th Gear last week. It showed a mock freeway crash caused due to fog and motorists who don't slow down. 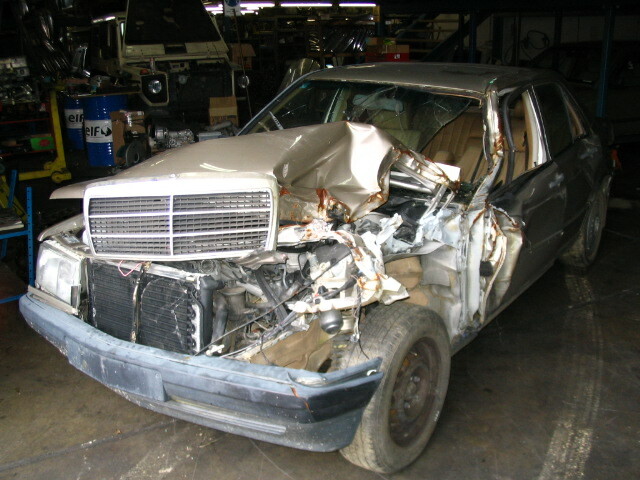 One of the crashes was a W126 running into the back of a stationary fiat Pinto. The Pinto was crushed to the extent that the front and rear wheels were touching each other and on the W126 the front doors still opened fine. The programs on all the FOXTEL channels tend to repeat themselves so no doubt this episode will be on again soon. It was worth watching. Now here is a very interesting story. Ever heard of a Gyrocar?? I was way for two weeks after Christmas so I have been back for two weeks now. And it has been very hectic. The 190E and 420SEL have been sold and we have taken a deposit on the 300E, the 230E and the 320CE cabriolet. The 420SEL was sold before we got it on the website. This seems to be a bit of a trend as we also brought a 1991 300E 2.6 in Sydney and sold it in Sydney even before we managed to get the Truck to pick it up and bring it down to us! New arrivals include a 1980 240D with manual transmission, a 1972 300SEL 3.5, a 1999 E430 Avantgarde, a 1997 C200, a 2000 ML320 with the rare 7 seat option and a 1999 C180. The C180 is a very nice car having been optioned with leather, alloy wheels and electric windows. Sorry, but we didn't have pictures for all of the new stock cars at the time of doing the newsletter. If you are interested in any of them please check back in a few days when we will have all the pictures done or e-mail us. We may have a W124 E320 with the rare Sportline option coming in the next few weeks. White with navy leather and a very nice car. This is going to be a very sort after car so if you have any interest in a car like this let me know. I have been driving the 220SE cabriolet for the last week and are very impressed with how it drives for a 40 year old car. This car was restored over 15 years ago and looks like it was finished only last year. Restoration work included a full respray, new rubbers, new soft top and an engine rebuild. We have receipts for all this work. We have done a few minor jobs with it including some bushes in the gear lever so that the horn does not sound automatically every time it was put into reverse!! STOP PRESS!!!!! We took the 220SE cabriolet to the Mercedes-Benz Club of the ACT Australia Day Breakfast and won the Show and Shine with it! 420SEL 1987 model only 115000kms!